Management of a complex paediatric orthopaedic problem. Department of Orthopaedics, Mediciti Institute of Medical Sciences, Hyderabad. Telangana, India. Introduction: Volkmann’s ischemic contracture (VIC) is a complex and variable flexion deformity of wrist and fingers resulting from fibrosis and contracture of flexor muscles of forearm. It is caused by ischemic injury to the deep tissues enclosed in the tight unyielding osteo-facial compartments secondary to neglected acute compartment syndrome. VIC may be associated with malunion or non-union of forearm fractures. To the best of our knowledge, this article is the first case report of VIC associated with atrophic non-union of ulna managed by shortening of forearm bones combined with transposition of intercalary auto graft from the fellow bone. Case Report: A seven year old boy presented with flexion deformity of wrist and hand with inability to use his left hand since three and half months subsequent to an injury to his left forearm due to fall from a tree of six feet height. The patient was diagnosed and treated by a native traditional bone setter for his Radius and Ulna fracture of left forearm with massaging and tight bandaging. On examination there was wasting of left forearm with positive Volkmann’s sign, flexion contracture of wrist with loss of grip strength and tenderness over the upper and middle third junction of left ulna with a palpable gap. The radiograph of forearm revealed atrophic non-union of left ulna. In order to tackle both the issues, shortening osteotomy of radius with transposition of tubular radius intercalary graft onto ulna was done. Radius was fixed with a dynamic compression plate and Ulna was fixed with a rush nail effecting overall two and half centimetres shortening of both bones of forearm. This approach has addressed both atrophic non-union of ulna and VIC in a single stage and gave excellent functional outcome till the last follow-up of three years from the date of surgery. Conclusion: Bone shortening and transposition of auto-graft from the fellow bone may prove to be an excellent treatment modality for VIC with associated non-union of involved compartmental bones in properly selected and executed cases. Keywords: Volkmann’s ischemic contracture, Volkmann’s sign, Atrophic non-union, Intercalary grafting, shortening osteotomy. Volkmann’s ischemic contracture (VIC) is a complex and variable flexion deformity of the fingers and wrist resulting from fibrosis and contracture of flexor muscles of forearm caused by ischemic injury secondary to neglected acute compartment syndrome [1,2,3]. VIC results from severe injury to the deep tissues such as muscles and nerves enclosed in the tight unyielding osteo-facial compartments secondary to increased intra-compartmental pressure. Raised intra-compartmental pressure and compartment syndrome is a complication of wide variety of insults ranging from severe soft tissue injuries, fractures of bones contained in the compartments, vascular injuries, burns and iatrogenic due to tight bandaging . Acute compartment syndrome is an orthopaedic emergency and needs to be appropriately addressed within four to six hours from its onset lest it should lead to VIC . VIC may present with varied injury combinations to soft tissues and bones contained in the involved compartment [1,3,4,5]. There are many treatment options described and followed world over for various types and grades of VIC [1,2,3,4,5]. Fifteen to twenty two percent of ischemic contractures occur as a complication of diaphyseal forearm fractures .The clinical picture may be compounded by malunion or non-union of diaphyseal fractures posing further difficulties in treatment  as failed healing alters the normal relationship of radius and ulna impairing elbow, wrist and forearm functions . Various treatment modalities have been proposed to treat non unions [6,7,8,9] but there is paucity of literature towards management of atrophic aseptic gap non-union of forearm bones complicated by Volkmann’s ischemia. This case report highlights a presentation of VIC  with atrophic non-union of ulna treated in a single stage with an effective functional outcome of non-union of ulna and VIC followed up for three years. To the best of our knowledge this article is the first case study of its kind to be reported in the literature. A seven year old right hand dominant boy allegedly fell down from a tree of six feet height and presented to the emergency room with an injury to his left forearm. He complained of pain, deformity of left forearm and inability to use left hand ever since the injury. On examination there was a tender swelling, deformity and abnormal mobility in the left forearm. Radiography of left forearm revealed fracture of both bones of forearm at upper and middle third junction (Fig 1: Radiograph of left forearm showing fracture of both bones of forearm at upper and middle third junction). Manipulative reduction and above elbow plaster slab application was done under sedation (Fig 2: Radiograph of left forearm after plaster slab application). Patient went home on the same day, against medical advice to stay back at hospital for observation. Subsequently he was treated by a traditional bone setter (quack) with multiple episodes of tight bandaging and massaging for a period of two months. Patient came back after three and half months with complaints of pain, wasting of left forearm, deformity of wrist and hand with inability to use his left hand. On examination there was decreased girth of left forearm, tenderness over the upper and middle third junction of left ulna with a palpable gap, positive Volkmann’s sign with flexion contracture of fingers. Flexion contracture of wrist flexors was noted and the grip strength was reduced. Intrinsic muscles of hand were spared. Sensory system of left forearm and hand was intact with no vascular deficit. Terminal limitation of movements at elbow with painful pronation and supination of forearm was noted. Radiograph of forearm with wrist and hand revealed atrophic non-union of upper and middle third junction of left ulna and malunion of left radius with positive Volkmann’s sign (flexion attitude of fingers with wrist in extension and the same getting corrected with the wrist in flexed position); (Fig 3: Clinical photograph and radiograph of left forearm showing atrophic non-union of upper and middle third junction of left ulna with malunion of left radius with Volkmann’s sign). Patient was taken up for surgery under general anaesthesia. Atrophic non union site of ulna was exposed sub-periosteally and all the intervening fibrous tissue with necrotic bone ends was excised, edges were freshened till punctuate bleeding points were noted in the bone. Medullary cavity was opened on both the sides. This has resulted in a gap of five centimetres in ulna. Radius was exposed sub-periosteally in the middle third portion through dorsal approach and two and half centimetres of tubular radial graft was harvested. The cut ends of the radius were approximated and fixed with small (3.5mm) dynamic compression plate and screws leading to a two and a half centimetre radial shortening (Fig 4: Intra operative photograph showing radial shortening osteotomy fixed with dynamic compression plate and screws). 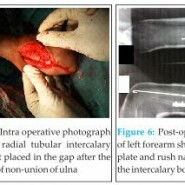 The two and half centimetre radial tubular graft was used as intercalary sturt graft at ulnar gap non-union site and was fixed with a rush nail from the olecrenon (Fig 5: Intra operative photograph showing radial tubular intercalary autograft placed in the gap after the excision of non-union of ulna). This has resulted in effective shortening of forearm by two and half centimetres to address the VIC component of the patient (Fig 6: Post operative radiograph of left forearm showing in situ radial plate and ulnar rush nail holding the intercalary bone graft in place). The limb was supported with an above elbow slab converted to a cast after suture removal. Patient did not maintain the cast properly. The cast was found to be broken at the elbow with lagged out rush nail at 6 weeks follow up requiring implant removal. (Fig 7: Six weeks follow up post-operative radiograph of left forearm taken after the implant removal from ulna). Forearm was supported with above elbow plaster cast for ten weeks. Finger stretching exercises/physiotherapy was started early in the post-operative period. Physiotherapy with range of motion elbow exercises and stretching exercises were stared after ten weeks. Patient was followed up regularly for three years and the fracture union was monitored by radiography. The radial osteotomy has united in six weeks and the ulnar intercalary graft site has united in ten weeks (Fig 8: Ten weeks follow up post operative radiograph showing union of radius and ulna). Volkmann’s sign was negative after the surgery till date (Fig 9: Post operative follow up clinical photograph of the patient showing absence of Volkmann’s sign). Functional evaluation of the limb revealed full flexion-extension at elbow, pronation-supination of forearm and normal grip strength of hand when compared with the contra lateral unaffected right upper limb. Three years following surgery, radial plate was removed owing to the patients request for implant removal (Fig 10: Three years follow up radiograph of left forearm after the radial implant removal showing consolidation and incorporation of intercalary tubular radial graft in the ulna). Atrophic non-union with or without gap is characterised by scarring, sclerosis and resorption of fracture ends with decreased blood supply and osteogenic potential for innate healing . Non-union of forearm bones occur when the fracture is inadequately immobilised leading to abrasion at the fracture site, resulting in bone loss . Aseptic non-union of forearm bones poses a challenge to orthopaedic surgeons, as failed healing alters the normal relationship of radius and ulna impairing elbow, wrist and forearm functions . The aim of surgical treatment in such cases would be to restore the reciprocal three dimensional shape and relationship of radius and ulna for appropriate recovery of function . Auto grafts are the gold-standard and are most commonly used to bridge the gaps in the treatment of atrophic and gap non-unions [6,7,8]. Acceptable bone shortening in forearm is scarcely reported as an effective alternative modality in selective cases in the treatment of non-union of forearm bones . It is proposed that the muscles of the involved extremity adapt to the alterations in skeletal length in cases where bones are shortened . This case classically represents neglected compartment syndrome caused by a combination of iatrogenic extrinsic pressure decreasing the compartment size in the form of tight external bandage applied by the native traditional bone setter and increased volume of the forearm compartments due to fracture of both bone of forearm ultimately ending in VIC. Repeated episodes of manipulation resulted in inadequate immobilisation of the fracture of ulna resulting in atrophic non-union. Given the context of atrophic non-union of ulna herein this case with VIC, graduated shortening of radius has provided two and half centimetres of autogenous tubular intercalary bone graft to be transposed onto the ulna and bridge the five centimetre gap at ulnar non-union site thereby effectively shortening the forearm length by two and half centimetres. This has effectively addressed VIC as well as gap non-union of ulna in a single sitting without any additional graft site morbidity in comparison with the conventional methods of harvesting iliac crest or autogenous fibula to bridge the gap at atrophic non-union site of ulna. VIC of forearm and hand may present with a variety of injury combinations to soft tissues and bones. This case report highlights one such combination of VIC and atrophic non-union of ulna treated in a single stage with shortening of both bones of forearm and transposition of tubular auto graft of radius onto ulna to bridge the non-union site ultimately resulting in the effective treatment of non-union of ulna and VIC. This rarely reported procedure may prove to be an excellent treatment modality for VIC with associated non unions of involved compartmental bones in properly selected and executed cases. Bone shortening is a rarely adopted salvage procedure for the management of VIC. Autologous iliac crest graft and fibular sturt grafts are frequently used to treat gap non-unions. In a given case of VIC associated with atrophic non-union of forearm bones, bone shortening and transposition of intercalary auto graft from the fellow bone will effectively and reliably address both the identified issues in a single sitting with no additional morbidity of harvesting bone graft from the conventional sites such as iliac crest or fibula. 1. Meyerding HW, Krusen FH. The treatment of Volkmann’s ischemic contracture. Ann Surg. 1939 Sep;110(3):417-26. 2. Stevanovic M, Sharpe F. Management of established Volkmann’s contracture of the forearm in children . Hand Clin. 2006 Feb;22(1):99-111. 3. Balakrishnan G. Ischaemic contracture of the hand. Indian J Plast Surg 2006;39:94-102. doi: 10.4103/0970-0358.26917. URL: Balakrishnan G. Ischaemic contracture of the hand. Indian J Plast Surg [serial online] 2006 [cited 2014 Nov 3];39:94-102. Available from: http:// www.ijps.org/ text.asp?2006/ 39/ 1/ 94/ 26917. 4. Seddon H. Volkmann’s ischaemia. Br Med J. 1964 Jun 20;1(5398):1587-92. 5. Tsuge K. Treatment of established Volkmann’s Contracture. J Bone Joint Surg Am. 1975 Oct; 57(7):925-9. 7. Davey PA, Simonis RB. Modification of the Nicoll bone-grafting technique for non union of radius and /or ulna. J Bone Joint Surg Br. 2002 Jan;84(1):30-3. 10. Zancolli E. Classification of established Volkmann’s ischemic contracture and the program for its treatment. In: Zancolli E, editor. Structural and Dynamic Bases of Hand Surgery. Philadelphia: JB Lippincott; 1979.p.314-24. 11. Jones R. Volkmann’s ischaemic contracture with special reference to treatment. Br Med J. 1928 Oct 13;2(3536):639–42. 12. Gelberman R H, Botte M J. Management of Volkmann’s Contracture. In: Chapman M W, editor. Chapman’s Orthopaedic Surgery, 3rd ed. Lippincott Williams & Wilkins, Philadelphia; 2001.p.1781-92. 14. Pavanini G, Volpe A. Diaphysary resection using Colzi’s method in the treatment of Volkmann’s syndrome. Clin Ortop. 1975-1976;26:287-92. 15. Domanasiewicz A, Jabłecki J, Kocieba R, Syrko M. Modified Colzi method in the management of established Volkmann contracture–the experience of Trzebnica Limb Replantation Center (preliminary report). Ortop Traumatol Rehabil. 2008 Jan-Feb;10(1):12-25.